It’s a beautiful Sunday afternoon in Washington, D.C. and Dupont Circle is bustling. Sunbathers soak in 75-degree rays around the central fountain, shoppers forage for farmers market finds and drivers wind their way around a maze of traffic lights, disgorging into urban arteries that will take them out of the heart of the city. But about 20 feet below Dupont’s hustle and bustle, more than a dozen young D.C. dwellers are holed up in a dark, dank tunnel armed with glue guns and Velcro. 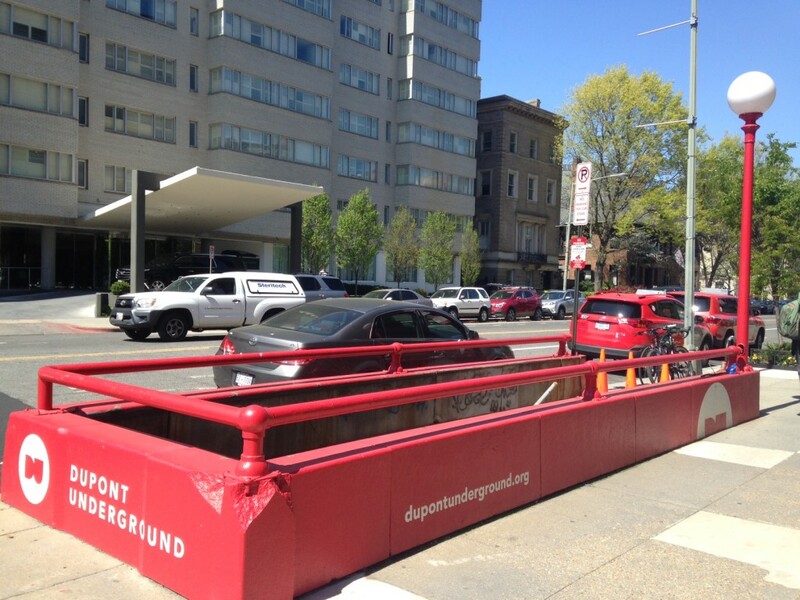 They’re part of an all-volunteer team creating the first public art installation for the Dupont Underground, an arts coalition dedicated to turning this 75,000 square-foot abandoned trolley station into a hub for arts, architecture and design. It’s taken six years for Dupont Underground’s team to turn this cavernous space into usable space –no vermin, they swear!– but finding its opening act was surprisingly swift. 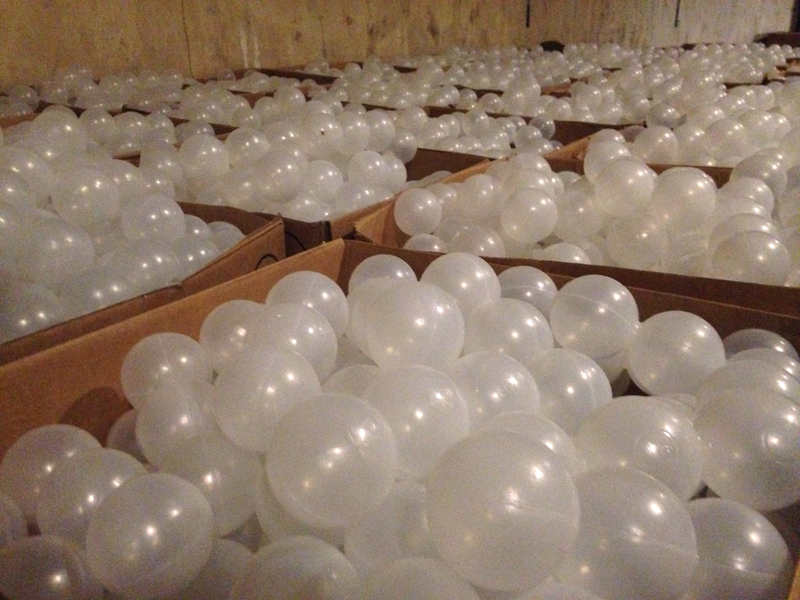 After its blockbuster BEACH installation last summer, the National Building Museum was awash in 650,000 3-inch plastic balls. For Dupont Underground, the balls were the perfect building blocks for what became the international design competition Re-Ball!. More than 90 competitors from 19 countries entered Re-Ball!, and after poring over designs that would suspend the balls in nets, twist them into snake-like tubes, and shape them into massive spheres, a jury of architects and experts chose a design they described as “part Lego, part Minecraft.” Dubbed “Raise/Raze” the winning team of Nancy Hou and Josh de Sousa decided the subterranean space would be best served by a design that would let visitors do a little creating of their own. For architect Craig Cook, director of Re-Ball!, a design that could be rearranged by anyone passing through hit all the right conceptual notes. But turning thousands of balls into structures that would complement a decidedly un-museum-like space has proven challenging. With barely more than a month to turn the winning concept into reality–Re-Ball! 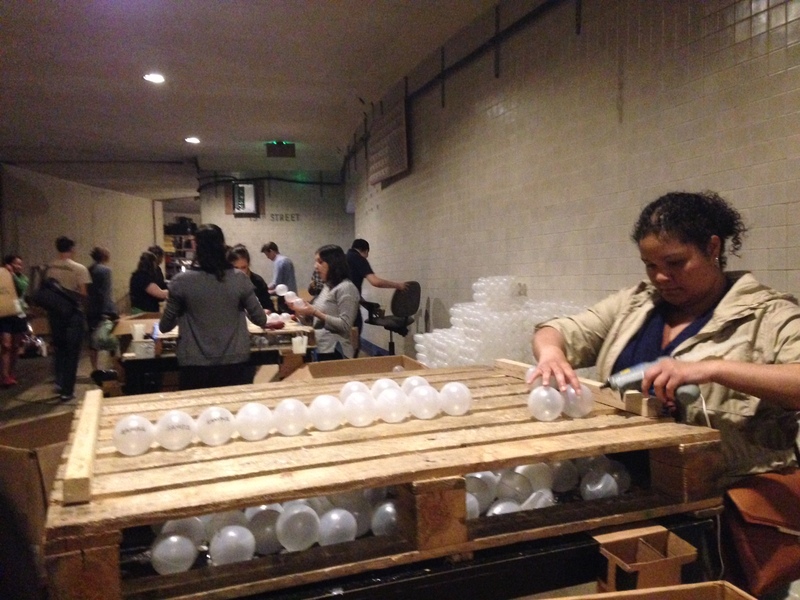 opens to the public April 30– volunteers have worked seven days a week to create nearly 18,000 cubes of balls–an experience Dupont Underground board member Philippa Hughes says can be slightly zen. A few feet from Hughes, a handful of volunteers place tiny velcro tabs on each cube of balls, pulling and prodding them to make sure the adhesives hold. This is public-art-as-production-line, but for D.C. resident Katie Bryon, there’s nowhere she’d rather be, even if it is a gorgeous spring day just a few feet above her. 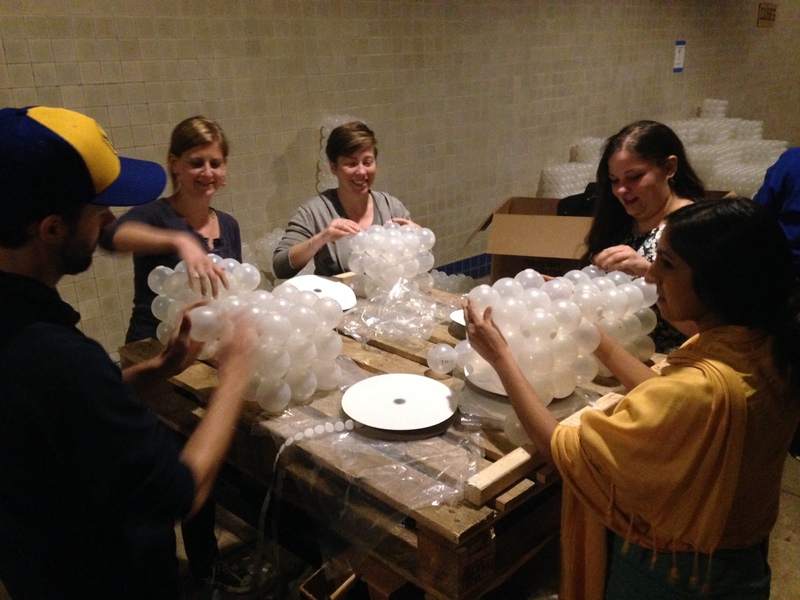 Volunteer Katie Bryon, second from right, creating cubes at a work station. Once volunteers create secure 27-ball cubes, they make their way to the last stop on the Underground’s production line: the designers. Stationed a few feet the Underground entrance, designers Hou and de Sousa are strategically placing the cubes into what resemble tree-like towers that spread onto the ceiling. Eventually their design will encompass five different “zones” —text, cave, grove, shell valley and government buildings— that visitors will be able to rearrange at will. For Hou and de Sousa, who spent weeks manipulating balls in their New York City studio, the reality of sticking this ambitious vision together isn’t without its practical challenges. 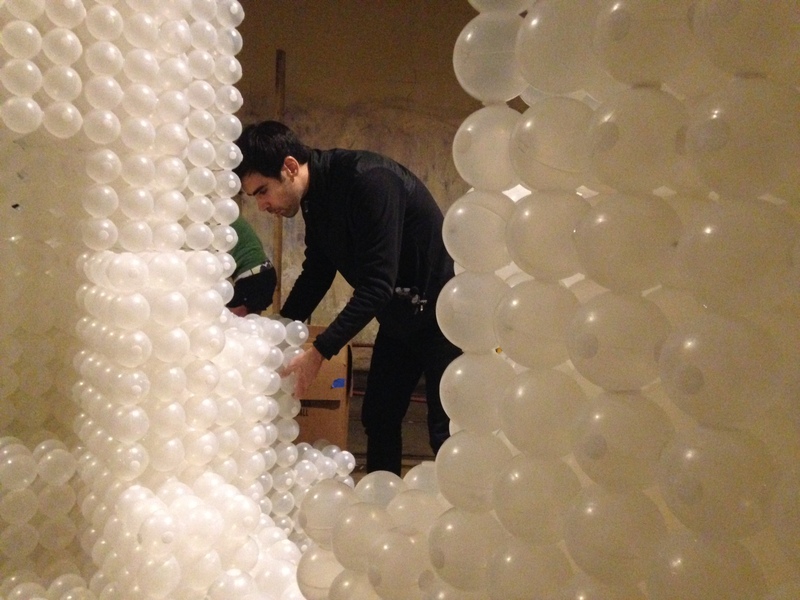 Designer Josh de Sousa constructs a tower from cubes of balls at the Dupont Underground. Hou and de Sousa say they won’t shed any tears if “Raise/Raze” ends up looking different from their opening-day design — just like the “BEACH,” visitors are encouraged play around a little. Dupont Underground even plans to keep a work station or two available for visitors who want to make their own cubes or repair errant balls in case they come loose. But viewing Re-ball! before it’s really razed requires reservations (and a release promising you won’t sue the organizers in case you fall into a hole on the trolley tracks.) Donating $25 to the exhibit’s crowdfunding page guarantees advanced admission and prime time slots. Tickets for the general public run around $16 and are available now.